The simply designed meetinghouse form is most often associated with the Quaker faith, but is also common to other religious sects, especially the Mennonites. Other early religious sects built meetinghouse style churches in Pennsylvania as well, including the Moravians, German Baptists, the German or Dutch Reformed, and the Brethren in Christ. In the early settlement period churches often shared a building for worship, so a meetinghouse may have been built to meet several sects’ needs. Basically, meetinghouses are physical manifestations of faith. Thus, religious sects that emphasized simplicity, piety, equality, and a focus on the spiritual, not material world chose the meetinghouse form of church as an expression of their religious values. Interestingly, the Amish, a sect with many of these values, do not build churches or meetinghouses; rather they worship in homes or barns. Quaker meetinghouses are among the earliest religious buildings in our state, since Pennsylvania was founded by Quaker William Penn as a colony committed to religious tolerance. The simple style of the Quaker meetinghouse was derived from late 17th century English patterns and then adapted for use in the colonies. The Quakers, like the Puritans of that era, desired simply styled churches with little ornamentation. The building form chosen by the Quakers in Pennsylvania usually had separate entrances for men and women and separate seating areas as well. Usually one or two stories in height, this Quaker meeting house form has a side gabled roof and often small gabled door hoods. As a vernacular building type, designed without an architect or a desire to follow current fashionable styles, the meetinghouse form remains relatively unaltered over time. However, there is some variation in the design of meetinghouses, due to the preferences of religious sects, regional preferences, or the era of construction. 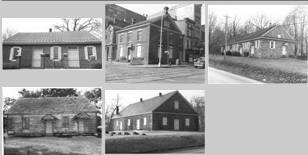 Built of stone, brick, log or clapboard, the meetinghouses are representative of building practices in their region. Interior detail is usually very minimal with pews or benches for seating, but no altar, decorative stained windows, or bell tower. Some meetinghouses have a front facing gable, but retain the side by side entry doors as does the New Providence Mennonite Church in New Providence, Lancaster County. 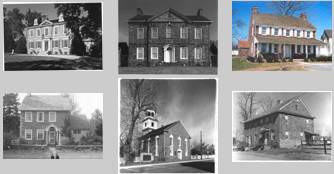 A Historic American Building Survey study of meetinghouses in southeastern Pennsylvania was undertaken in 1997 and produced photos and measured drawings of these buildings dating from 1695 to 1903. This HABS data is available at http://lcweb2.loc.gov/ammem/hhhtml.This article is a part of a series from the Pennsylvania Historical and Museum Commission’s excellent field guide on the architectural styles found in Pennsylvania. In it, they’ve assigned key periods of development – from the Colonial period in the 18th Century to the Modern Movements of the 29th Century. This article focuses on an overview of the Traditional/Vernacular style in Pennsylvania from 1638 through 1950 PA Architecture Georgian Style 1700 - 1800 Identifiable Features 1. Symmetrical form and fenestration (window placement) 2. Multi-pane windows (6-20 panes in each sash) 3. Side-gabled or hipped roof 4. Stone or brick walls 5. Transom window over paneled front door 6. Pediment or crown and pilasters at front entry 7. Cornice with dentils 8. Water table or belt course 9. Corner quoins The Georgian style, identified by its symmetrical composition and formal, classical details, was the most prevalent style in the English colonies throughout the 18th century. It was the first architect-inspired style in America, a distinct departure from the more utilitarian, earlier buildings that followed prevailing folk traditions. The Georgian style arrived in America via British architectural building manuals called pattern books around 1700. While the Georgian style was popular in England in the 17th and 18th centuries, it is based on the classical forms of the earlier Italian Renaissance period. English master architects Inigo Jones, Christopher Wren and James Gibbs, inspired by the classicism of the Italian Renaissance developed the Georgian style in England. As the style spread to the colonies, it reflected a period of colonial growth and prosperity and a desire for more formally designed buildings. A typical Georgian house in Pennsylvania is a stone or brick two-story building with a side-gabled roof and a symmetrical arrangement of windows and doors on the front façade. Usually 5 bays (or openings) across with a center door, the style also commonly features a pedimented or crowned front entrance with flanking pilasters. Other commonly seen details are multi-paned sliding sash windows, often in a 6 light over 6 light pattern, a dentiled cornice, and decorative quoins at the corners of the building. Smaller Georgian buildings might be only 3 bays across, and feature either a center door or side door. The side door version is called a "Two-thirds Georgian" since it follows the Georgian style but lacks two of the usual five bays across the front. This variant of the style, adapted to an urban setting, appears in rowhouse or townhouse form in the state’s early cities. Some Georgian buildings in Pennsylvania were built with a pent roof between the first and second stories, although this was not the common form. Another regional variation of the style is the hooded front door, marked by a shallow roof projecting from the decorative crown at the front entry. Elements of the Georgian style in various vernacular forms appear on buildings in Pennsylvania throughout the 18th century and beyond.This article is a part of a series from the Pennsylvania Historical and Museum Commission’s excellent field guide on the architectural styles found in Pennsylvania. In it, they’ve assigned key periods of development – from the Colonial period in the 18th Century to the Modern Movements of the 29th Century. This article focuses on an overview of the Traditional/Vernacular style in Pennsylvania from 1638 through 1950 PA Architecture Queen Anne Style 1880 – 1910 Identifiable Features 1. Abundance of decorative elements 2. Steeply pitched roof with irregular shape 3. Cross gables 4. Asymmetrical facade 5. Large partial or full width porch 6. Round or polygonal corner tower 7. Decorative spindlework on porches and gable trim 8. Projecting bay windows 9. Patterned masonry or textured wall surfaces including half timbering 10. Columns or turned post porch supports 11. Patterned shingles 12. Single pane windows, some with small decorative panes or stained glass For many, the Queen Anne style typifies the architecture of the Victorian age. With its distinctive form, abundance of decorative detail, corner tower, expansive porches and richly patterned wall surfaces, the Queen Anne style is easy to identify. High style Queen Anne buildings are often considered local landmarks, ornate and showy attention getters. This style is present in communities across the country in numerous variations of form and detail. It was the most popular style for houses in the period from 1880 to 1900, but is often employed for large scale public buildings as well. The style was first created and promoted by Richard Norman Shaw and other English architects in the late 19th century. The name refers to the Renaissance style architecture popular during the reign of England’s Queen Anne (1702-1714). Actually, the Queen Anne style is more closely related to the medieval forms of the preceding Elizabethan and Jacobean eras in England. The style became popular in the United States through the use of pattern books and the publishing of the first architectural magazine “The American Architect and Building News.” The Queen Anne style evolved from those early English designs to become a distinctly American style with numerous, sometimes regional variations. The use of three dimensional wood trim called spindlework was an American innovation made possible by the technological advances in the mass production of wood trim and the ease of improved railroad transport. While the Queen Anne style can take a variety of forms, certain key elements are commonly found. Queen Anne buildings almost always have a steep roof with cross gables or large dormers, an asymmetrical front façade, and an expansive porch with decorative wood trim. A round or polygonal front corner tower with a conical roof is a distinctive Queen Anne feature on many buildings of this style. Wall surfaces are usually highly decorative with variety of textures from shingles to half timbering, to panels of pebbles or bas relief friezes. This article is a part of a series from the Pennsylvania Historical and Museum Commission’s excellent field guide on the architectural styles found in Pennsylvania. In it, they’ve assigned key periods of development – from the Colonial period in the 18th Century to the Modern Movements of the 29th Century. 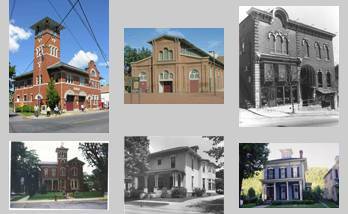 This article focuses on an overview of the Traditional/Vernacular style in Pennsylvania from 1638 through 1950 PA Architecture Stick Style 1860 - 1890 Identifiable Features 1. Steeply pitched gable roof 2. Cross gables 3. Decorative trusses at gable peak 4. overhanging eaves with exposed rafters 5. Wood exterior walls with clapboards 6. horizontal, vertical or diagonal decorative wood trim - stickwork 7. Porches with diagonal or curved braces 8. Towers The most distinctive stylistic element of the Stick style is the decorative stickwork or bands of wood trim applied horizontally, vertically or diagonally to the exterior wall surfaces. A similar pattern of decorative wood trim appears in the trusses of the gables and across gables and on the porch braces. The stick style is considered to be a transitional style, with decorative details similar to the preceding Gothic Revival Style , and a shape and form closely related to the following Queen Anne Style. All three styles are inspired by Medieval English building tradition and thus, share some common features. Unlike the Gothic Revival style, the Stick style treats wall surfaces, not just doorways, cornices, windows and porches as decorative elements. Like other Picturesque styles, the Stick style was promoted by the pattern books of Andrew Jackson Downing in the mid-1800s. The exterior stickwork was considered to be display structural honesty by showing the supportive wooden understructure on the outside. Since the stickwork on the walls was purely decorative rather than structurally relevant, such an argument for the greater integrity of form of this style seems somewhat unfounded. The Stick style was never as popular and wide spread as the somewhat later Queen Anne Style which appears in various forms all over Pennsylvania and the United States.This article is a part of a series from the Pennsylvania Historical and Museum Commission’s excellent field guide on the architectural styles found in Pennsylvania. In it, they’ve assigned key periods of development – from the Colonial period in the 18th Century to the Modern Movements of the 29th Century. This article focuses on an overview of the Traditional/Vernacular style in Pennsylvania from 1638 through 1950 PA Architecture Traditional Octogon 1850 - 1870 Identifiable Features 1. Octagonal shaped building 2. Low pitched hipped roof 3. Wide overhanging eaves 4. Brackets at the cornice 5. Partial or fully encircling porch 6. Octagonal cupola on some versions The Octagon Mode is a distinctive and remarkable yet relatively rare architectural style, which enjoyed a brief period of popularity primarily in the years from 1850 until 1870. Previously, Adam- or Federal-style buildings had occasionally featured octagonal wings or projections, so the octagon form was not a new creation. Several prominent designers (including Thomas Jefferson) built octagon buildings in the United States in the late 18th and early 19th century, but the octagon house form seldom appeared until it was reintroduced to the public through the writings of Orson Squire Fowler in 1848. Fowler was a public lecturer, writer, and eccentric, and he promoted this style in his book The Octagon House: A House for All. He viewed the octagon form as a healthful, economical, and modern innovation in housing and argued that it offered increased sunlight and ventilation, as well as savings on heating and building costs. Octagon houses were built across the country but were more of an anomaly than a common style. The Northeast and Midwest had the greatest number of octagon buildings. Octagon houses often incorporated elements of other styles, the Greek and Gothic Revival styles, and especially the Italianate. Few residences were built in the octagon style after 1865. However, the octagon form continued to be used for barn and outbuilding construction from the mid to late 1800s. Tollhouse and railroad stations of this era were sometimes built in the octagon form as well. Interestingly, the octagon appeared in Pennsylvania almost one hundred years before Fowler published his book, in the form of small stone school buildings in the southeastern portion of the state. Documentation suggests that Quakers began building octagonal stone school buildings in southeastern Pennsylvania as early as the 1760s. It is assumed that this school form is derived from English or Scots-Irish folk tradition, a variation on the one-room schoolhouse. The Quakers are thought to have embraced this octagonal school form due to the simplicity of its design, simplicity being a key principle of the Quaker faith. Additionally, the octagonal style buildings were practical, being less expensive to build and heat, and easier to ventilate and light. By the early 1800s, the stone octagonal school house form was so common in southeastern Pennsylvania that both Quakers and non-Quakers employed it. Several of these unique octagonal stone schools survive, with construction dates from 1802 to 1841.This article is a part of a series from the Pennsylvania Historical and Museum Commission’s excellent field guide on the architectural styles found in Pennsylvania. In it, they’ve assigned key periods of development – from the Colonial period in the 18th Century to the Modern Movements of the 29th Century. This article focuses on an overview of the Traditional/Vernacular style in Pennsylvania from 1638 through 1950 PA Architecture Chateauesque Style 1860 - 1910 Identifiable Features 1. French chateau-like appearance 2. Round tower with conical roof 3. Steeply pitched hipped or gable roof, often with cresting 4. Tall chimneys with decorative caps 5. Round arch or flattened basket-handle arch entry 6. Multiple dormers 7. Quatrefoil or arched tracery decorative elements 8. Balustraded terrace 9. Usually of masonry (stone or brick) construction The Chateauesque style is exactly what it sounds like: an effort to recreate the appearance and stylistic elements of the palatial French chateaus of the 16 th century. Details borrow elements from the Gothic style and the Renaissance style, just as the original Chateau designs did. The Chateauesque style was popularized in the US by by architect Richard Morris Hunt, the first American to study at the Ecole des Beaux-Arts in France . Buildings of this style are almost always architect-designed, grand places intended to impress. Chateauesque style buildings are easy to identify due to their imposing appearance and characteristic complex roof line with abundant detailing. Buildings of this style have steeply pitched hipped (and sometimes gabled) roofs, topped by cresting or finials, and pierced by decorative gabled wall dormers. Low relief carving may ornaments the dormer gables and window surrounds. Chimneys are tall and have decorative corbelled tops. Another standout feature is a round tower topped by a conical roof, although some more modest examples of the style may omit the tower. Balconies may feature Gothic inspired quatrefoil or arched tracery patterns. Entry doors often have round arches or a flattened arch with an ogee arch molding. Most examples of this rather rare style are found in a sophisticated urban setting or on an estate where such opulent, high style buildings might be expected. Several outstanding mansions of Chateauesque style have been identified in the Philadelphia area and also public buildings such as city halls in other locations. After the turn of the 20th century, elements of the Chateauesque style were incorporated into a revival form sometimes called the French Eclectic style. Identified by a round tower with a high conical roof and steeply pitched hipped roof, this style often appears in early 20th century neighborhoods along with other popular revival styles of the the era, such as the Tudor and Colonial Revival styles.This article is a part of a series from the Pennsylvania Historical and Museum Commission’s excellent field guide on the architectural styles found in Pennsylvania. In it, they’ve assigned key periods of development – from the Colonial period in the 18th Century to the Modern Movements of the 29th Century. This article focuses on an overview of the Traditional/Vernacular style in Pennsylvania from 1638 through 1950 PA Architecture Renaissance Revival Style 1890 - 1930 Identifiable Features 1. Low-pitched hipped or flat roof 2. Symmetrical facade 3. Masonry construction 4. Impressive size and scale 5. Round arch entrance and windows 6. Classical details: columns, pilasters 7. Roof line parapet or balustrade 8. Arcaded and rusticated ground level The Italian Renaissance Revival style developed at the very end of the Victorian period of architecture. Like the Romanesque styles and other later classically-inspired styles, the Italian Renaissance Revival style looked to Italy and the ancient world for inspiration. This style developed in direct contrast to the medieval form and appearance of other popular styles of the time, the Gothic Revival, Queen Anne, and Shingle styles. This style and the earlier Italianate style both were modeled on the 16th century buildings of the Italian Renaissance. However, Italian Renaissance Revival style buildings are much closer stylistically to the original form than the Italianate style. This added authenticity was due to greater familiarity with the original buildings—via photographs versus pattern books—and advances in masonry veneering techniques that developed in the early 20th century. The most predominant feature of this style is its imposing scale and formal design incorporating classical details such as columns and round arches and balustrades. This style can take several distinct forms, but all variations are almost always of masonry (usually stone) construction. One version of the style features a large rectangular building, usually three or more stories in height, topped by a flat roof with a crowning balustrade. Another common feature for this flat roof version of the Italian Renaissance Revival style is a rusticated stone first floor with upper floors having a smooth finish. Porch arcades and porticos are often seen in this version as well. The other most common form of this style features a hipped roof, often of clay tiles, with broadly overhanging, bracketed eaves. This variation bears some resemblance to the Spanish Colonial Revival style (also known as the Mission style) which was popular in the same period. While having a similar form and tiled roof, the Spanish Colonial Revival style lacks the classical details like columns, pilasters and pedimented windows. The Italian Renaissance Revival style was first popularized on the East Coast by architects such as McKim, Mead & White as early as the 1880s. This elegant style is seen mostly in up-scale, architect-designed buildings, such as mansions or public buildings. While many examples of this style can be found in Pennsylvania, it is most common in city settings. The 1920s-era State Office complex (North and South Office Buildings, Finance Building, and Forum Building), adjacent to the Beaux Arts State Capitol building in Harrisburg, is of this style. This article is a part of a series from the Pennsylvania Historical and Museum Commission’s excellent field guide on the architectural styles found in Pennsylvania. In it, they’ve assigned key periods of development – from the Colonial period in the 18th Century to the Modern Movements of the 29th Century. This article focuses on an overview of the Traditional/Vernacular style in Pennsylvania from 1638 through 1950 PA Architecture Italianate Villa/Italianate Style 1840 - 1885 Identifiable Features 1. Cornice with decorative brackets 2. Widely overhanging eaves 3. Two or three stories in height 4. Tall, narrow windows 5. Curved (segmental) arches over windows or doors 6. Elaborate window crowns, often arched or with brackets and pediments 7. Single story porches, either full width or entry porticos 8. Low pitched roof 9. Cupola or square tower with bracketed cornice 10. Quoins The Italian Villa/Italianate style was also part of the romantic and picturesque movement, a quest to provide architectural forms that evoked a romanticized region or earlier period of history. Previous architectural styles had also looked to the past for design inspiration, but those styles were all based on the more formal classical buildings of ancient Rome and Greece . The Romantic movement was to some degree a rebellion against architecture’s strict adherence to the classical form. The movement expressed a desire for greater freedom of architectural expression and for more organic, complicated forms that were intended to complement their natural setting. The Italianate style was modeled after the medieval farmhouses of the Italian countryside. These farmhouses were irregularly shaped and seemed to fit naturally into their rustic settings, an important objective of the Romantic Movement. The Italianate and Gothic Revival styles were made popular by the published pattern books of architect Andrew Jackson Downing in the 1840s and 1850s. This style first developed as the Italianate Villa style, which was seen as early as the 1830s and was intended as a suitable design for substantial homes or country estates. The most outstanding feature of the Italianate Villa style is the square tower, topped with a bracketed cornice. The Italianate Villa style is also marked by irregular massing (not a simple square or rectangular shape), and an L or T shaped floor plan. As the style evolved from the Italianate Villa to the Italianate form, the square tower and irregular massing were not always present, but other elements of the style continued, notably the decorative bracketed cornice. Freestanding Italianate buildings display the cornice under widely overhanging eaves, while contiguous Italianate rowhouses or commercial buildings have a bracketed cornice on the front façade. Other markers of the Italianate style are tall, narrow windows, some with elaborate hoods, often shaped like an inverted U. Italianate windows often have round arch tops and can also be crowned by a pediment or entablature with brackets. Most Italianate buildings have columned porticoes or porches, sometimes extending across the full width of the front façade. The Italianate style was very prevalent within its period of popularity, more so than the Gothic Revival Style. It was especially dominant in the period from 1855 through 1880. Since it was easily adapted to numerous building forms, it became a popular style for urban and rural residences and commercial and institutional buildings. The Italianate style is especially identified as the common architectural theme of mid- to late-19th century commercial buildings that lined the main street of many American cities and towns. Downtown streetscapes of this era are marked by a continuous line of distinctive bracketed cornices. The Italianate style was also commonly used for the construction of urban townhouses, again easily identified by their common bracketed cornices and long, narrow windows. Some decorative elements were of cast iron, a newly developed technology in this period. This article is a part of a series from the Pennsylvania Historical and Museum Commission’s excellent field guide on the architectural styles found in Pennsylvania. In it, they’ve assigned key periods of development – from the Colonial period in the 18th Century to the Modern Movements of the 29th Century. 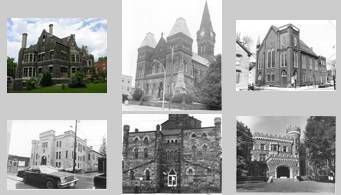 This article focuses on an overview of the Traditional/Vernacular style in Pennsylvania from 1638 through 1950 PA Architecture High Victorian Gothic Style 1860 - 1890 Identifiable Features 1. Linear decorative polychrome bands of brick or stone 2. Masonry construction 3. Stone quoins 4. Pointed arch (Gothic) windows and doorways 5. Steeply gabled roofs, often with cross gables 6. Ornamental pressed brick and terra cotta tiles 7. Patterned brick chimneys 8. Corbelled brickwork 9. Turret with conical roof The High Victorian Gothic style is similar to the earlier Gothic Revival style, but is a more heavier, more substantial version of the style. The High Victorian Gothic style was used mostly for large scale public buildings like schools, churches, or government offices, but was sometimes chosen for mansions or homes of substantial size. Always executed in brick or stone, High Victorian Gothic buildings are distinguished by the use of polychrome bands of decorative masonry. Stone quoins, pressed brick, and terra cotta panels were commonly used. Windows and doors were accented with brick or stone trim, often in contrasting colors. The Gothic pointed arch may be present at windows, entrances, and decorative dormers and cross gables. Round turrets with corbelled brickwork and conical roofs are common to this style as well. The High Victorian Gothic style developed in England in around the mid point of the 19 th century. English architect John Ruskin, author of “The Seven Lamps of Architecture” (1849) was a major proponent of the style, finding “constructural coloration” superior to superficially applied color. Initially, this style was inspired by English medieval architecture, but later it drew from medieval French and German building traditions as well. The High Victorian Gothic style did not fully emerge in the United States until after the Civil War. Since this style was most often employed for high-style public buildings or mansions, it was essentially an urban building type. It was often used for the design of schools and libraries. One of Pennsylvania ’s best examples of this style is the Pennsylvania Academy of Fine Arts in Philadelphia , designed by Frank Furness in 1876.This article is a part of a series from the Pennsylvania Historical and Museum Commission’s excellent field guide on the architectural styles found in Pennsylvania. In it, they’ve assigned key periods of development – from the Colonial period in the 18th Century to the Modern Movements of the 29th Century. 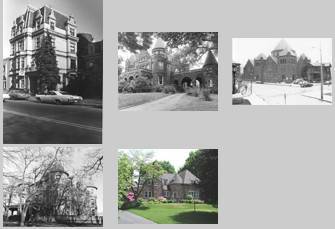 This article focuses on an overview of the Traditional/Vernacular style in Pennsylvania from 1638 through 1950 PA Architecture Collegiate Gothic Style 1890 - 1940 Identifiable Features 1. Gothic arch window and door openings 2. Masonry (brick or stone) construction 3. Bas relief decorative panels or plaques 4. Portico or recessed porch entryway 5. Buttresses 6. Tracery windows 7. Crenulated parapet 8. Tower or spire The Collegiate Gothic Revival style is an early 20th century adaptation of the 19th century Gothic Revival style to serve a specific function, educational buildings. The Gothic Revival style, which flourished from the period of 1830 through 1890 in the United States, was often chosen for churches and institutional buildings due to its impressive, medievally-inspired form. In the early 20th century the Gothic Revival style reappeared for an appropriate choice for both university and secondary school buildings. 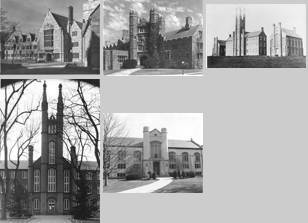 Prominent universities such as Boston College, Yale, Duke, and Princeton employed the Collegiate Gothic Revival style in this period to create an atmosphere of respected antiquity. In the 1920s and 30s, many new public and private schools were built in Pennsylvania as a result of changes in educational policy. These new larger and more complex school buildings had specialized space design for cafeterias, gyms and technical training and were often of Collegiate Gothic style. While these designs were sometimes rather pared down versions of the more ornate forms of the style with only a few decorative details like an arched and recessed entryway or a few decorative panels, these school buildings are clearly part of the Gothic Revival tradition. Masonry construction lent a sense of permanence and substance, a fitting image for the public education system, especially as it strove for even greater academic offerings. The Collegiate Gothic Revival style can be found throughout the state in the public and private secondary schools of cities and towns, and also on university campuses. The Philips Memorial Building at West Chester University is a noted example of this style and was built in 1927. Constructed in 1930, Bishop McDevitt High School (originally called Catholic High School) in Harrisburg is another good example of this style as seen as a private secondary school. The simply designed meetinghouse form is most often associated with the Quaker faith, but is also common to other religious sects, especially the Mennonites. Other early religious sects built meetinghouse style churches in Pennsylvania as well, including the Moravians, German Baptists, the German or Dutch Reformed, and the Brethren in Christ. In the early settlement period churches often shared a building for worship, so a meetinghouse may have been built to meet several sects’ needs. Basically, meetinghouses are physical manifestations of faith. Thus, religious sects that emphasized simplicity, piety, equality, and a focus on the spiritual, not material world chose the meetinghouse form of church as an expression of their religious values. Interestingly, the Amish, a sect with many of these values, do not build churches or meetinghouses; rather they worship in homes or barns. Quaker meetinghouses are among the earliest religious buildings in our state, since Pennsylvania was founded by Quaker William Penn as a colony committed to religious tolerance. The simple style of the Quaker meetinghouse was derived from late 17th century English patterns and then adapted for use in the colonies. The Quakers, like the Puritans of that era, desired simply styled churches with little ornamentation. The building form chosen by the Quakers in Pennsylvania usually had separate entrances for men and women and separate seating areas as well. Usually one or two stories in height, this Quaker meeting house form has a side gabled roof and often small gabled door hoods. As a vernacular building type, designed without an architect or a desire to follow current fashionable styles, the meetinghouse form remains relatively unaltered over time. However, there is some variation in the design of meetinghouses, due to the preferences of religious sects, regional preferences, or the era of construction. Built of stone, brick, log or clapboard, the meetinghouses are representative of building practices in their region. Interior detail is usually very minimal with pews or benches for seating, but no altar, decorative stained windows, or bell tower. Some meetinghouses have a front facing gable, but retain the side by side entry doors as does the New Providence Mennonite Church in New Providence, Lancaster County. A Historic American Building Survey study of meetinghouses in southeastern Pennsylvania was undertaken in 1997 and produced photos and measured drawings of these buildings dating from 1695 to 1903. This HABS data is available at http://lcweb2.loc.gov/ammem/hhhtml. The Georgian style, identified by its symmetrical composition and formal, classical details, was the most prevalent style in the English colonies throughout the 18th century. It was the first architect-inspired style in America, a distinct departure from the more utilitarian, earlier buildings that followed prevailing folk traditions. The Georgian style arrived in America via British architectural building manuals called pattern books around 1700. While the Georgian style was popular in England in the 17th and 18th centuries, it is based on the classical forms of the earlier Italian Renaissance period. English master architects Inigo Jones, Christopher Wren and James Gibbs, inspired by the classicism of the Italian Renaissance developed the Georgian style in England. As the style spread to the colonies, it reflected a period of colonial growth and prosperity and a desire for more formally designed buildings. A typical Georgian house in Pennsylvania is a stone or brick two-story building with a side-gabled roof and a symmetrical arrangement of windows and doors on the front façade. Usually 5 bays (or openings) across with a center door, the style also commonly features a pedimented or crowned front entrance with flanking pilasters. Other commonly seen details are multi-paned sliding sash windows, often in a 6 light over 6 light pattern, a dentiled cornice, and decorative quoins at the corners of the building. Smaller Georgian buildings might be only 3 bays across, and feature either a center door or side door. The side door version is called a “Two-thirds Georgian” since it follows the Georgian style but lacks two of the usual five bays across the front. This variant of the style, adapted to an urban setting, appears in rowhouse or townhouse form in the state’s early cities. Some Georgian buildings in Pennsylvania were built with a pent roof between the first and second stories, although this was not the common form. Another regional variation of the style is the hooded front door, marked by a shallow roof projecting from the decorative crown at the front entry. Elements of the Georgian style in various vernacular forms appear on buildings in Pennsylvania throughout the 18th century and beyond. For many, the Queen Anne style typifies the architecture of the Victorian age. With its distinctive form, abundance of decorative detail, corner tower, expansive porches and richly patterned wall surfaces, the Queen Anne style is easy to identify. High style Queen Anne buildings are often considered local landmarks, ornate and showy attention getters. This style is present in communities across the country in numerous variations of form and detail. It was the most popular style for houses in the period from 1880 to 1900, but is often employed for large scale public buildings as well. The style was first created and promoted by Richard Norman Shaw and other English architects in the late 19th century. The name refers to the Renaissance style architecture popular during the reign of England’s Queen Anne (1702-1714). Actually, the Queen Anne style is more closely related to the medieval forms of the preceding Elizabethan and Jacobean eras in England. The style became popular in the United States through the use of pattern books and the publishing of the first architectural magazine “The American Architect and Building News.” The Queen Anne style evolved from those early English designs to become a distinctly American style with numerous, sometimes regional variations. The use of three dimensional wood trim called spindlework was an American innovation made possible by the technological advances in the mass production of wood trim and the ease of improved railroad transport. While the Queen Anne style can take a variety of forms, certain key elements are commonly found. Queen Anne buildings almost always have a steep roof with cross gables or large dormers, an asymmetrical front façade, and an expansive porch with decorative wood trim. A round or polygonal front corner tower with a conical roof is a distinctive Queen Anne feature on many buildings of this style. Wall surfaces are usually highly decorative with variety of textures from shingles to half timbering, to panels of pebbles or bas relief friezes. The most distinctive stylistic element of the Stick style is the decorative stickwork or bands of wood trim applied horizontally, vertically or diagonally to the exterior wall surfaces. A similar pattern of decorative wood trim appears in the trusses of the gables and across gables and on the porch braces. The stick style is considered to be a transitional style, with decorative details similar to the preceding Gothic Revival Style , and a shape and form closely related to the following Queen Anne Style. All three styles are inspired by Medieval English building tradition and thus, share some common features. Unlike the Gothic Revival style, the Stick style treats wall surfaces, not just doorways, cornices, windows and porches as decorative elements. Like other Picturesque styles, the Stick style was promoted by the pattern books of Andrew Jackson Downing in the mid-1800s. The exterior stickwork was considered to be display structural honesty by showing the supportive wooden understructure on the outside. Since the stickwork on the walls was purely decorative rather than structurally relevant, such an argument for the greater integrity of form of this style seems somewhat unfounded. The Stick style was never as popular and wide spread as the somewhat later Queen Anne Style which appears in various forms all over Pennsylvania and the United States. The Chateauesque style is exactly what it sounds like: an effort to recreate the appearance and stylistic elements of the palatial French chateaus of the 16 th century. Details borrow elements from the Gothic style and the Renaissance style, just as the original Chateau designs did. The Chateauesque style was popularized in the US by by architect Richard Morris Hunt, the first American to study at the Ecole des Beaux-Arts in France . Buildings of this style are almost always architect-designed, grand places intended to impress. Chateauesque style buildings are easy to identify due to their imposing appearance and characteristic complex roof line with abundant detailing. Buildings of this style have steeply pitched hipped (and sometimes gabled) roofs, topped by cresting or finials, and pierced by decorative gabled wall dormers. Low relief carving may ornaments the dormer gables and window surrounds. Chimneys are tall and have decorative corbelled tops. Another standout feature is a round tower topped by a conical roof, although some more modest examples of the style may omit the tower. Balconies may feature Gothic inspired quatrefoil or arched tracery patterns. Entry doors often have round arches or a flattened arch with an ogee arch molding. Most examples of this rather rare style are found in a sophisticated urban setting or on an estate where such opulent, high style buildings might be expected. Several outstanding mansions of Chateauesque style have been identified in the Philadelphia area and also public buildings such as city halls in other locations. After the turn of the 20th century, elements of the Chateauesque style were incorporated into a revival form sometimes called the French Eclectic style. Identified by a round tower with a high conical roof and steeply pitched hipped roof, this style often appears in early 20th century neighborhoods along with other popular revival styles of the the era, such as the Tudor and Colonial Revival styles. The Italian Renaissance Revival style developed at the very end of the Victorian period of architecture. Like the Romanesque styles and other later classically-inspired styles, the Italian Renaissance Revival style looked to Italy and the ancient world for inspiration. This style developed in direct contrast to the medieval form and appearance of other popular styles of the time, the Gothic Revival, Queen Anne, and Shingle styles. This style and the earlier Italianate style both were modeled on the 16th century buildings of the Italian Renaissance. However, Italian Renaissance Revival style buildings are much closer stylistically to the original form than the Italianate style. This added authenticity was due to greater familiarity with the original buildings—via photographs versus pattern books—and advances in masonry veneering techniques that developed in the early 20th century. The most predominant feature of this style is its imposing scale and formal design incorporating classical details such as columns and round arches and balustrades. This style can take several distinct forms, but all variations are almost always of masonry (usually stone) construction. One version of the style features a large rectangular building, usually three or more stories in height, topped by a flat roof with a crowning balustrade. Another common feature for this flat roof version of the Italian Renaissance Revival style is a rusticated stone first floor with upper floors having a smooth finish. Porch arcades and porticos are often seen in this version as well. The other most common form of this style features a hipped roof, often of clay tiles, with broadly overhanging, bracketed eaves. This variation bears some resemblance to the Spanish Colonial Revival style (also known as the Mission style) which was popular in the same period. While having a similar form and tiled roof, the Spanish Colonial Revival style lacks the classical details like columns, pilasters and pedimented windows. The Italian Renaissance Revival style was first popularized on the East Coast by architects such as McKim, Mead & White as early as the 1880s. This elegant style is seen mostly in up-scale, architect-designed buildings, such as mansions or public buildings. While many examples of this style can be found in Pennsylvania, it is most common in city settings. The 1920s-era State Office complex (North and South Office Buildings, Finance Building, and Forum Building), adjacent to the Beaux Arts State Capitol building in Harrisburg, is of this style. The Italian Villa/Italianate style was also part of the romantic and picturesque movement, a quest to provide architectural forms that evoked a romanticized region or earlier period of history. Previous architectural styles had also looked to the past for design inspiration, but those styles were all based on the more formal classical buildings of ancient Rome and Greece . The Romantic movement was to some degree a rebellion against architecture’s strict adherence to the classical form. The movement expressed a desire for greater freedom of architectural expression and for more organic, complicated forms that were intended to complement their natural setting. The Italianate style was modeled after the medieval farmhouses of the Italian countryside. These farmhouses were irregularly shaped and seemed to fit naturally into their rustic settings, an important objective of the Romantic Movement. The Italianate and Gothic Revival styles were made popular by the published pattern books of architect Andrew Jackson Downing in the 1840s and 1850s. This style first developed as the Italianate Villa style, which was seen as early as the 1830s and was intended as a suitable design for substantial homes or country estates. The most outstanding feature of the Italianate Villa style is the square tower, topped with a bracketed cornice. The Italianate Villa style is also marked by irregular massing (not a simple square or rectangular shape), and an L or T shaped floor plan. As the style evolved from the Italianate Villa to the Italianate form, the square tower and irregular massing were not always present, but other elements of the style continued, notably the decorative bracketed cornice. Freestanding Italianate buildings display the cornice under widely overhanging eaves, while contiguous Italianate rowhouses or commercial buildings have a bracketed cornice on the front façade. Other markers of the Italianate style are tall, narrow windows, some with elaborate hoods, often shaped like an inverted U. Italianate windows often have round arch tops and can also be crowned by a pediment or entablature with brackets. Most Italianate buildings have columned porticoes or porches, sometimes extending across the full width of the front façade. The Italianate style was very prevalent within its period of popularity, more so than the Gothic Revival Style. It was especially dominant in the period from 1855 through 1880. Since it was easily adapted to numerous building forms, it became a popular style for urban and rural residences and commercial and institutional buildings. The Italianate style is especially identified as the common architectural theme of mid- to late-19th century commercial buildings that lined the main street of many American cities and towns. Downtown streetscapes of this era are marked by a continuous line of distinctive bracketed cornices. The Italianate style was also commonly used for the construction of urban townhouses, again easily identified by their common bracketed cornices and long, narrow windows. Some decorative elements were of cast iron, a newly developed technology in this period. The High Victorian Gothic style is similar to the earlier Gothic Revival style, but is a more heavier, more substantial version of the style. The High Victorian Gothic style was used mostly for large scale public buildings like schools, churches, or government offices, but was sometimes chosen for mansions or homes of substantial size. Always executed in brick or stone, High Victorian Gothic buildings are distinguished by the use of polychrome bands of decorative masonry. Stone quoins, pressed brick, and terra cotta panels were commonly used. Windows and doors were accented with brick or stone trim, often in contrasting colors. The Gothic pointed arch may be present at windows, entrances, and decorative dormers and cross gables. Round turrets with corbelled brickwork and conical roofs are common to this style as well. The High Victorian Gothic style developed in England in around the mid point of the 19 th century. English architect John Ruskin, author of “The Seven Lamps of Architecture” (1849) was a major proponent of the style, finding “constructural coloration” superior to superficially applied color. Initially, this style was inspired by English medieval architecture, but later it drew from medieval French and German building traditions as well. The High Victorian Gothic style did not fully emerge in the United States until after the Civil War. Since this style was most often employed for high-style public buildings or mansions, it was essentially an urban building type. It was often used for the design of schools and libraries. One of Pennsylvania ’s best examples of this style is the Pennsylvania Academy of Fine Arts in Philadelphia , designed by Frank Furness in 1876. The Collegiate Gothic Revival style is an early 20th century adaptation of the 19th century Gothic Revival style to serve a specific function, educational buildings. The Gothic Revival style, which flourished from the period of 1830 through 1890 in the United States, was often chosen for churches and institutional buildings due to its impressive, medievally-inspired form. In the early 20th century the Gothic Revival style reappeared for an appropriate choice for both university and secondary school buildings. Prominent universities such as Boston College, Yale, Duke, and Princeton employed the Collegiate Gothic Revival style in this period to create an atmosphere of respected antiquity. In the 1920s and 30s, many new public and private schools were built in Pennsylvania as a result of changes in educational policy. These new larger and more complex school buildings had specialized space design for cafeterias, gyms and technical training and were often of Collegiate Gothic style. While these designs were sometimes rather pared down versions of the more ornate forms of the style with only a few decorative details like an arched and recessed entryway or a few decorative panels, these school buildings are clearly part of the Gothic Revival tradition. Masonry construction lent a sense of permanence and substance, a fitting image for the public education system, especially as it strove for even greater academic offerings. The Collegiate Gothic Revival style can be found throughout the state in the public and private secondary schools of cities and towns, and also on university campuses. The Philips Memorial Building at West Chester University is a noted example of this style and was built in 1927. Constructed in 1930, Bishop McDevitt High School (originally called Catholic High School) in Harrisburg is another good example of this style as seen as a private secondary school.